Sailing Croatia with Cata sailing is easy. Professional and friendly service. If you are a passionate sailor and look for the professional, personalised and friendly charter service in Croatia, then Cata Sailing d.o.o is your ideal choice. We are a team of enthusiastic, experienced and trained charter professionals. Our goal is to provide supreme level of service to our clients and partners. Our fleet, of carefully selected catamarans and sailing yachts, allows you to experience ultimate privacy, control and freedom while discovering Croatian coast. We specially took care, our yachts have extensive equipment. Therefore they meet high safety, navigation and comfort standards. Peculiar attention is devoted to boat maintenance, impeccable cleanliness and technical performance. We offer personalised approach and uncompromising quality of services. In addition to our great passion for what we do, we make shore every moment of your holiday is spent in the best possible way. Our yachts are placed in 2 attractive charter bases SCT Marina Trogir and ACI Dubrovnik. Both marinas are easily accessible whether you are coming by plane car or ferry. 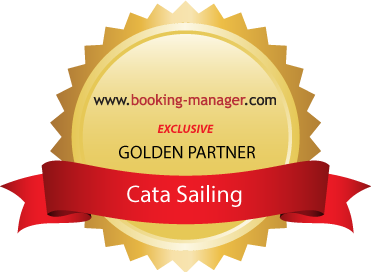 Cata Sailing has been awarded Charter company of the year on the Traditional event Days of Croatian Tourism. The manifestation took place on Hvar, organised by Croatian National Tourist Board, Chamber of commerce and Ministry of Tourism. In addition Cata sailing is an authorised user of the MYBA E-Contract.